If you're really in pain, drop by a Relax The Back® store in Studio City and sit in their Zero Gravity chair for an hour." This was the advice one Relax The Back® Studio City client received from their doctor. Since the beginning, Relax The Back® has worked with the medical community to find solutions for back and neck pain. In fact, the medical community often refers patients to the Studio City back store as a complement to the services they provide. Products like the Zero Gravity recliner by Human Touch® help take pressure off the spine, creating a Neutral Posture, in which the body is in its most relaxed, comfortable state. Back pain sufferers are particularly encouraged to try out this product, as well as our back store’s complete line of Tempur-Pedic® mattresses, pillows, and accessories. The staff at the Relax The Back® store in Studio City is specially trained to fit you with products that can improve posture and circulation as well as relieve symptoms associated with spinal stenosis, sciatica, degenerative disc disease, and more. Together, we work with you to find 24-hour solutions. From the time you get up in the morning until the time you go to bed, our back store in Studio City has the products to meet your needs. Visit our back store in Studio City for the best selection of back comfort and back pain relief products. Your employees (whether they number 2 or 200) are your most important asset. Good ergonomics keep them healthier and more productive. A healthy workspace is the sum of many parts. It's a system based on whole body ergonomics, where best angles, proper heights and convenient levels all work together to achieve maximum comfort. The way we see it, work shouldn’t be a pain. Ever. At Relax The Back, we understand that proper ergonomics is the key to happier, more productive employees. Our Consultants have completed in-depth training and achieved national recognition as Certified Ergonomics Assessment Specialists. This makes them uniquely qualified to help you choose the right products for your work area, and to conduct on-site workplace evaluations based on guidelines from the Occupational Safety & Health Administration. • Multi-Chair Discounts - We cater to corporations of any size. We provide ergonomic consultations and discounts on multi-chair orders. • Ergonomic Office Assessment - Let our Business Ergonomics Consultant properly assess your work environment and help you select products and accessories to properly support you while you work. 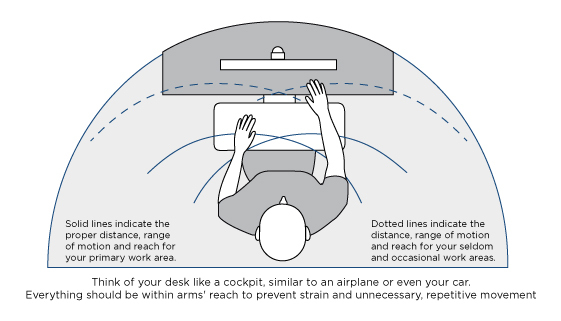 • FREE Office Ergonomics Education - We’ll educate your staff on the proper workstation set-up and how to work more efficiently to avoid injury. • FREE In-Office Set-up - Once your products arrive, we’ll deliver them to your office and educate you on the proper use of the product and how to incorporate them into your workstation for maximum effectiveness. • Each year, 1.8 million U.S. workers experience work-related injuries caused by overexertion or repetitive motion – injuries known as musculoskeletal disorders (MSDs). About 600,000 of those are serious enough to require time off work and account for one-third of all workers’ compensation costs annually. • According to the Occupational Health and Safety Administration (OSHA), the average cost per incidence of an MSD is estimated to be $12,000, which includes lost work with full wages, replacement wages, lost productivity, and medical treatment (not including surgery). If surgery is required, the average cost bumps up to $43,000 per incidence, according to the American Society of Orthopedic Surgeons. • In her March 2013, Keynote Address at the Applied Ergonomics Conference (Dallas, TX), Janet Froetscher, President & CEO of the National Safety Council said that companies could save between $9 Billion to $23 Billion in Workers’ Comp expenses if they invested in Ergonomics. We also accept purchase orders and provide an easy solution for quick product re-ordering. 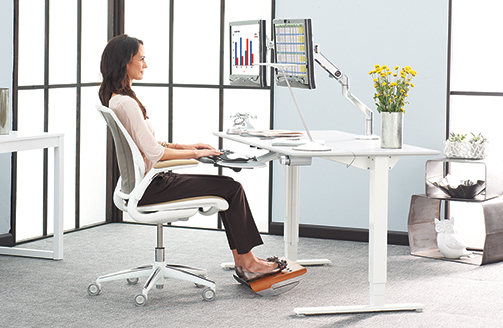 Relax The Back makes buying chairs and other ergonomic office accessories for your company easier.